Our skilled employees can provides professional cleaning services to all industrial estate, commercial buildings and shopping arcade by operating advanced cleaning equipment. Apart from daily cleaning work, we also provide surfaces waxing and polishing, curtain walls cleaning and protector treatments. 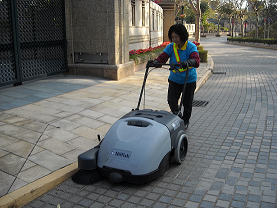 We deploy adequate manpower, utilise different cleaning equipment and material on our scheduled services depend largely on the scale of the estate and the habitation of the residents. This way we can satisfy our customers' requirements efficiently while maintaining low cost. 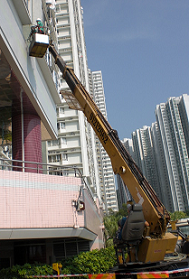 For cleaning exterior of building walls, pavement and car parks we utilise our possessed fleet of high pressure machines and water tank vehicles with high pressure system. One of the advantages of employing this method is that, it can be used in conjunction with cleaning products which penetrates and loosen dirt. This allows the high pressure water jet to removes the dirt easily. From statistical results and estimations, by year 2011, there are more than 6000 tones of municipal solid waste required for collection and disposal in Hong Kong alone everyday. Polyking recognised this important fact and we determine to concentrate our effort and energy in refusing these wastes appropriately for our customers. 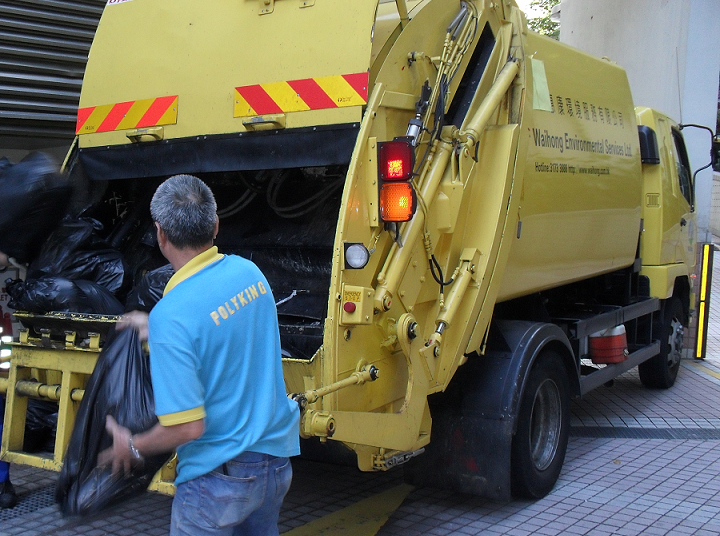 Our Waste Disposal Division is fully capable of collecting and disposing surplus junks effectively and efficiently by employing special refuse collection vehicles and help the recycle process extensively. Daily vacuum cleaning can only eliminate dust from trapping inside the carpets. Our Carpet Shampoo and Protection Cleaning Division provides a more thorough carpet cleaning and treatment service for shops and offices, these includes: shampooing, steaming and dry cleaning. Polyking also provides a comprehensive carpet protection services for newly laid carpet. This application forms an invisible surface barrier by sealing the fabric with repellent in order to protect the carpet from dirt and benevolent a longer lasting effect. 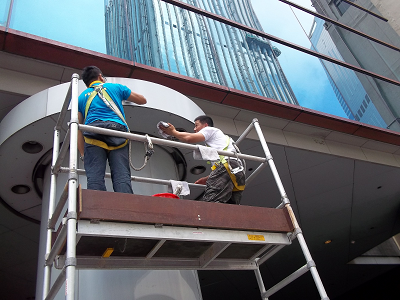 Our licenced professional offers building exterior walls and windows technical cleaning treatment by using gondola and high platform machinery. To meet the demand for ever improving standards of cleanliness, comfort and sanitation of our customers' premises, Polyking offers our clients a series of housekeeping services. Our building attendants' possess a professional know-how to ensure your premises are in a clean and tidy condition and services facilities are in good working order at all-time. We are determined and highly motivated in offering our customers a clean, healthy and comfortable living environment. 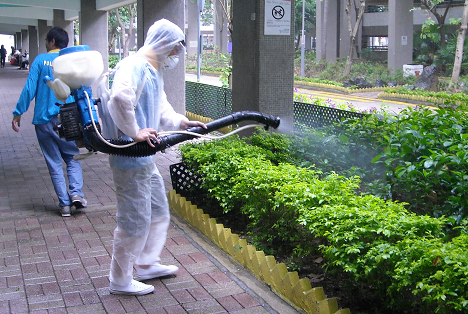 Polyking have fully trained and track record experience staffs to perform routine spraying services for our customers in order to eradicate pests, cockroach, fleas, flies, termite, rats and mosquitoes. We choose our least toxic pesticide carefully to minimise the environmental impact and ensure it is government approved. Following this regulations, we can be definite that it has little or no harm to human beings and home pets. Polyking strive ourselves as highly responsive and flexible, hence our mobility team of skilful cleaners and supervisors with sophisticated machineries is always ready to offer all kinds of cleaning services to a wide range of customers. From "one-off' monthly scheduled specialise cleaning, e.g. marble floor crystallisation, polishing and burnishing, to emergency incidents, e.g. typhoon and flooding, our mobility team can react quickly with productive help in restoration and minimise clients' loss. We can provide competent personnel to examine and clean the potable and flushing water tanks periodically in accordance with the guidelines set by Water Supplies Department and ensure clients can enjoy goo quality of drinking-water.